A bold statement from an iPhone user – yes! The following list comes from a few years of experience as a user of both Android and iOS based devices. Both operating systems have pros and cons but when it comes to getting your child’s first smartphone, there’s a lot to consider in choosing a device if you want to have the best experience with parental control apps. Remember, it’s more than just a “phone” – it’s a mobile computer you are giving your child. Firstly, parents you do not have to change your iOS device to Android – our parent mode offers the same feature set for both platforms plus our web dashboard is accessible from any platform (a laptop, tablet or desktop is still recommended). Secondly, if you see your child spending way too much time on mindless games and Snapchat streaks or Instagram stories, we feel your pain (we’re dads too! ), an Android device is the best way to control your child’s screen time and apps the use. Finally, if you are currently looking at the inevitable purchase of your child’s first mobile device in time for back to school or upgrading to a new one, again, Android is the way to go. This is especially true if you want to best experience in a parental control app. Better app management: We can block any app that’s installed on your child’s device. We can allow specific apps to work past any screen time limits (like educational ones – as a place to start, Common Sense Media provides some great resources for good apps by age groups). We continue to add “app groups” where our user feedback and research allows us to index several apps into groups by type and block them. An example are web browsers, this allows our SPIN Safe Browser to be the default and only browser your child uses while we block all others like Chrome, Firefox and even the stock web browser. Screen time habits: Empower conversations with your family about good technology habits by reviewing app time spent on their device. Too much Instagram? No problems, limit it to 30 minutes per day! Too much time on the device? No problems, set daily time allowances that count down when social media apps or games are used but doesn’t count spent on Always Allowed educational apps. Bedtime usage? The obvious recommendation is to not allow the mobile device in bedrooms at night and the second recommendation is to use our built-in schedules when the device can be used – all automatically. Text and call logs: this is a very popular feature for parents purchasing their child their first smartphone. With our built in dictionary, parents get notified when a bad word is detected in incoming/outgoing texts, we flag unknown numbers that are texting with your child too. We can also enforce who’s calling your child with call management – block any number, allow only numbers from their contacts app and for both Texts and Calls – review 30 days worth of activity via our Parent Mode reports. We notify you via our app and via email when these event occurs too. Security and enforcement: Apple doesn’t allow us to enforce our app from being removed by the user (hold-tap and our app will shake waiting to get deleted!). So kids can easily remove our app – we are aware of this event and notify parents but this leaves parents frustrated as they have to reinstall the app. On Android, you cannot remove our app unless the user knows the family group password! This is a optional feature for Android devices but most parents enable it. YouTube App monitoring: We are the world’s first parental control app to monitor videos watched and searches made inside the YouTube App! Review these activities via our Parent Mode reports. We can also block access to the Settings inside the YouTube app. Why? Because parents can set up the YouTube app to enforce Restricted Mode (so safer videos will be seen) and turn off auto-play (minimize binge watching videos non-stop). Enforced Safe Browsing: Leveraging our powerful app blocking technology, we elegantly block all web browsers on Android devices so kids cannot go around our SPIN Safe Browser even if they install another web browser! We enable this approach by default in our child mode setup. Our web browser is fully featured, has the same feature set for iOS and Android, enforces safe searches via Google results and images plus blocks millions os bad websites. Again, on iOS, we cannot make SPIN the default browser. We can block Safari completely but there’s no current approach to block all other web browsers except for SPIN Safe Browser. Cheaper to replace: The odds are very high that kids will break their first device – this could be from dropping it resulting in a cracked screen, dropping the phone in water at the local creek on a school field trip (I know this one from personal experience) or simply not taking care of it well. With that in mind, there’s no point spending $1000 on a mobile device. From personal experience, an Android device can be purchased without a contract, added to your family contract without issue or even go with a cheaper mobile carrier and still have good features to take selfies and run all of the apps they will need. Lastly, from our users’ and our own experience with our families, installing a parental control app like Boomerang needs to be a family conversation. 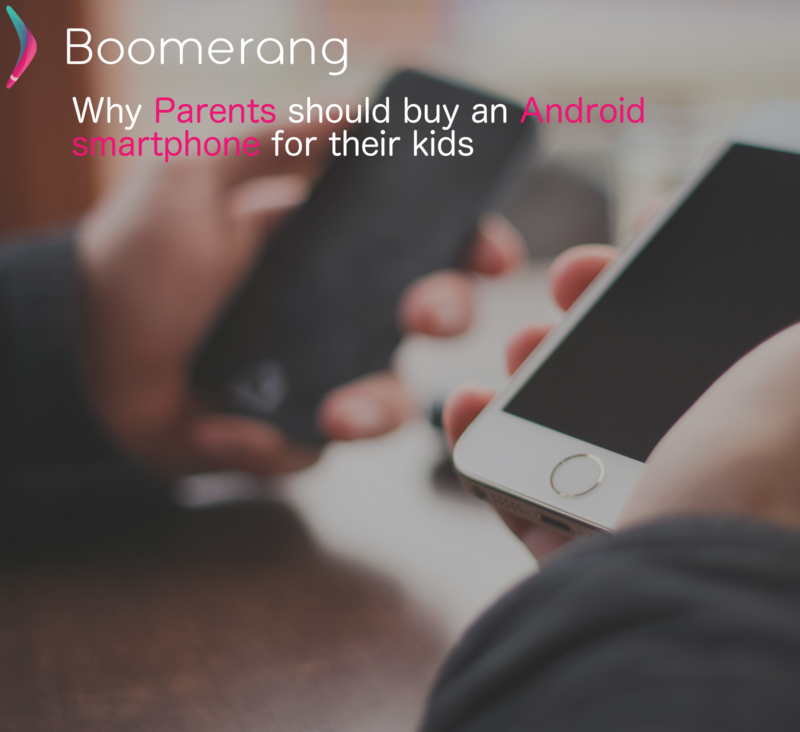 Before you install Boomerang, Android or iOS, we recommend you sit down with your child, share why you are installing the app, show them how you are it setting up, and be open about working on getting their buy-in by having them share their experience with you – you may need to tweak settings a bit and that’s all normal. We have thousands of users sharing their family scenarios with us daily and have a lot of experience helping parents parent their family technology with tricks and tips. Contact me anytime.